Perfect for relaxing meals anywhere! 5 recessed compartments help hold items in place. Great for use in bed, on the floor or on the couch. Portable lightweight table perfect for meals anywhere. 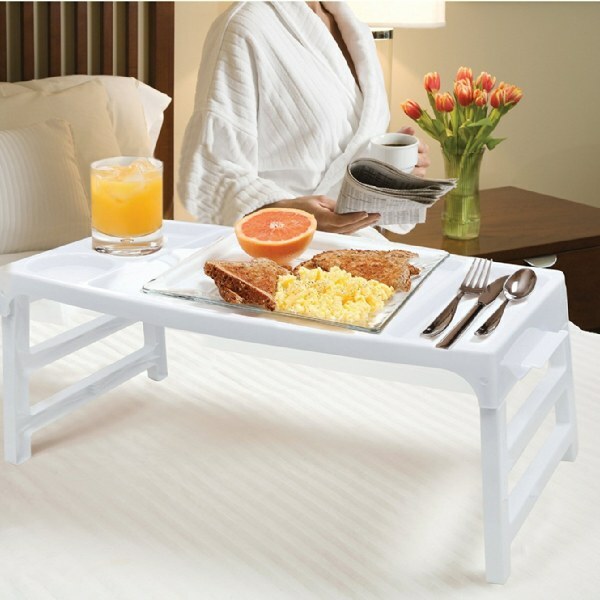 This portable serving tray with recessed compartments is ideal for eating in your favorite room, breakfast in bed, and more. The large 19" x 11" tray with 5 separate recessed areas helps hold coffee cups, plates and other food items in place. Folding legs make it convenient to store when not in use. Durable, thick plastic design withstands everyday use and cleans up easily with soap and water.